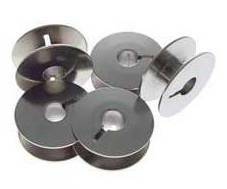 Metal bobbins specifically for Pfaff sewing machines. *Item can be purchased in bulk ($30.00/100 pcs). Price will be adjusted on actual invoice.